While overall cancer death rates in the United States are going down, the rate of decline in rural areas is slower than in other areas. Researchers at Holden Comprehensive Cancer Center at the University of Iowa have received a two-year, $200,000 grant from the National Cancer Institute (NCI) to address that disparity by helping to devise new research strategies that can support health care providers in Iowa’s rural communities, where many hospitals are struggling to maintain their cancer-control efforts. The grant is a supplement to the funding Holden receives as Iowa’s only NCI-designated comprehensive cancer center. The project is part of a nationwide effort by the NCI to seed local research initiatives to help generate new approaches to cancer prevention and control in underserved areas. 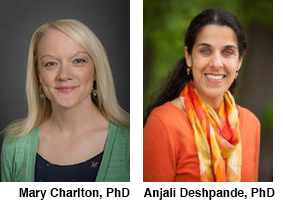 Two Holden researchers in the UI College of Public Health—Mary Charlton, PhD, assistant professor of epidemiology, and Anjali Deshpande, PhD, clinical associate professor of epidemiology—will lead the project. George Weiner, MD, director of Holden Comprehensive Cancer Center, serves as principal investigator. The project team has already reviewed the community health-improvement plans of hospitals in 24 rural Iowa counties with high incidences of cancer and found that only seven listed cancer screening or cancer care as a priority. The aim of the project is to establish a state-wide research infrastructure, based at Holden Comprehensive Cancer Center, that will support those hospitals and other rural health care providers in their search for new, sustainable cancer-control methods. The project will rely on established collaborations among Holden, the Iowa Cancer Consortium, and the State Health Registry of Iowa, while building new relationships with the University of Iowa Rural Policy Research Institute Center for Rural Health Policy Analysis and the University of Iowa Cancer Prevention and Control Research Network. The project team will collect data from a core group of hospitals, providers, and community organizations in six underserved Iowa counties. Representatives from that group will form the basis of a rural cancer research advisory board at Holden that will develop and disseminate a strategic plan for ongoing, community-engaged research. The result will be a model that can be duplicated in other communities. Early data collection will help the rural cancer research advisory board identify research priorities. In the long term, the project’s findings and recommendations will help hospitals, providers, and community organizations to procure funding to act on the research agenda articulated by the board.